I recently saw a DIY wall art pin going around on Pinterest (original link here) and thought I’d take a spin at it. 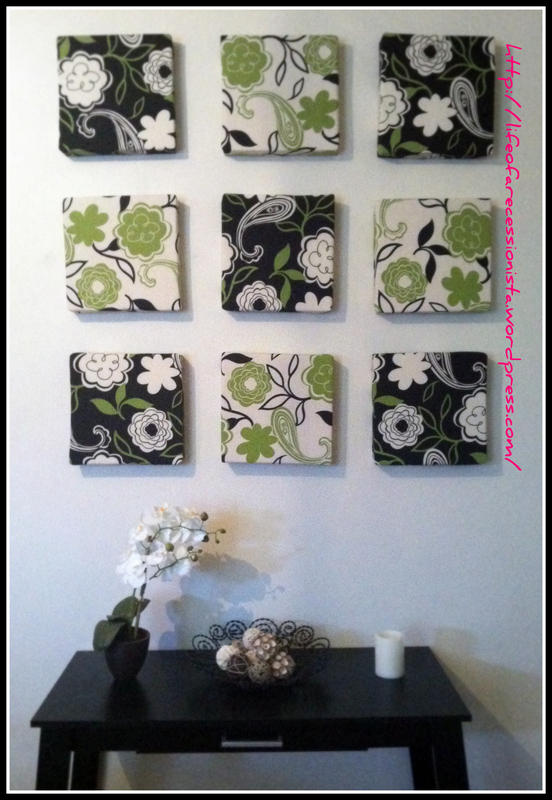 I had this huge bare wall in my apartment and needed something to tie together my green walls with the black accents in my kitchen. Honestly, the results were much better than I expected. It consists basically of covered pieces of styrofoam. 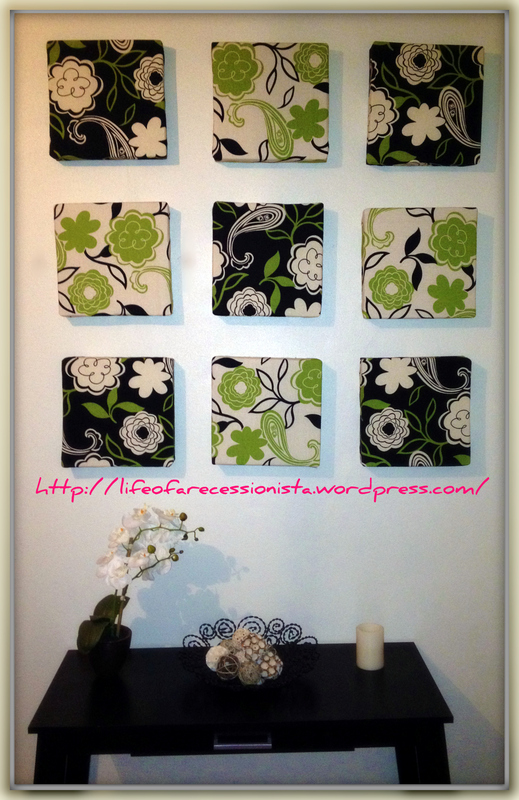 It is super easy, inexpensive and looks amazing. The original post covered the foam with scrapbook paper but complained that the glue created a ripple effect on the paper so I thought I’d give it a try with fabric to give it that “canvas” style look. 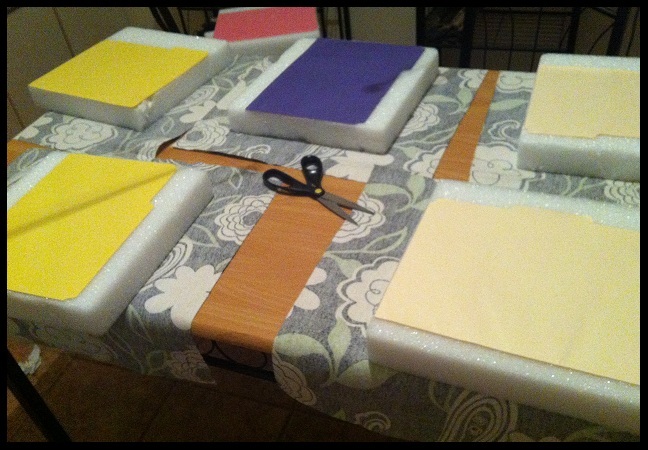 Measure and cut the foam into the desired shape. I chose to cut it into squares. Tip: I would recommend purchasing the white solid foam. 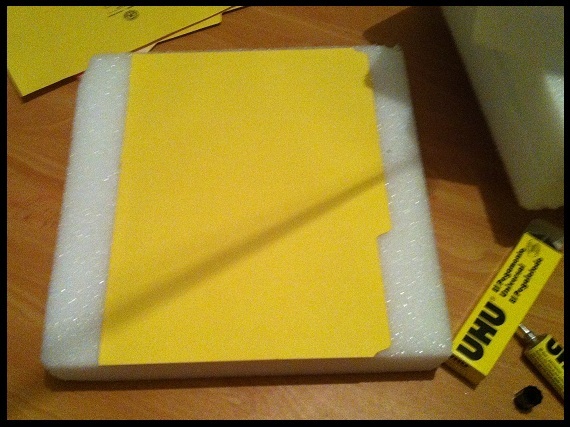 The one I purchased was the clear, “plasticky” one and and unfortunately would soaked up the glue like a sponge. Measure your fabric so that you have enough to completely cover the front and sides of the foam but leaving an opening in the backside. Since I had a total of nine foam squares, I cut 5 squares of one fabric and 4 of the other to create a checkerboard effect. 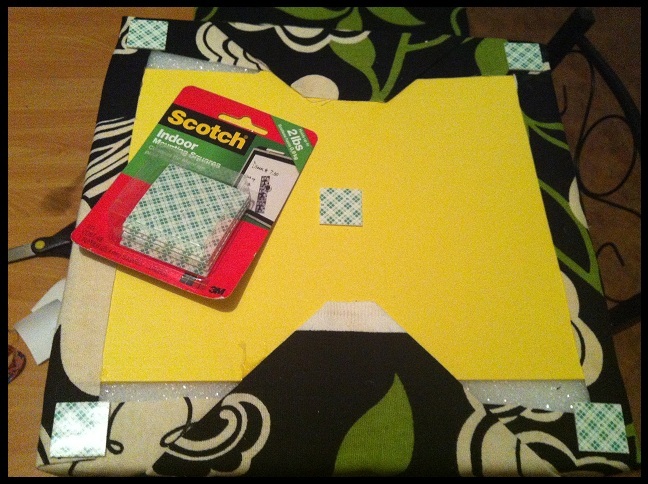 Glue the fabric onto the foam squares leaving the cardboard side exposed. Let dry for 24 hours. 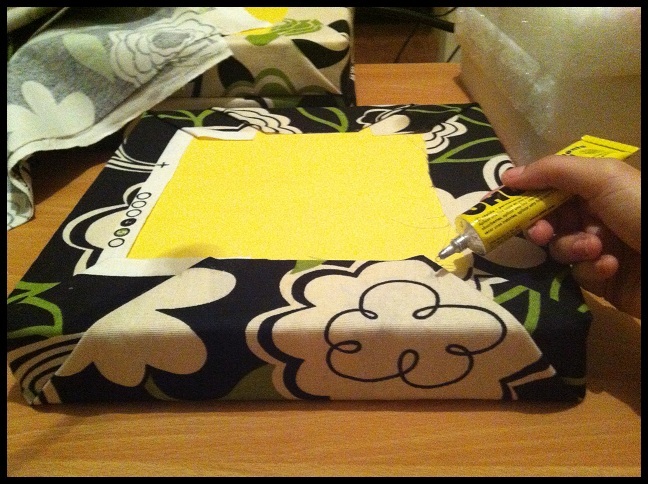 Tip: Fold the fabric as if you were wrapping a gift and glue the ends and the corners where you would apply tape if you were wrapping a gift. I have a ton of makeup brushes which I hate cleaning. I also keep forgetting to buy stuff to clean them with. 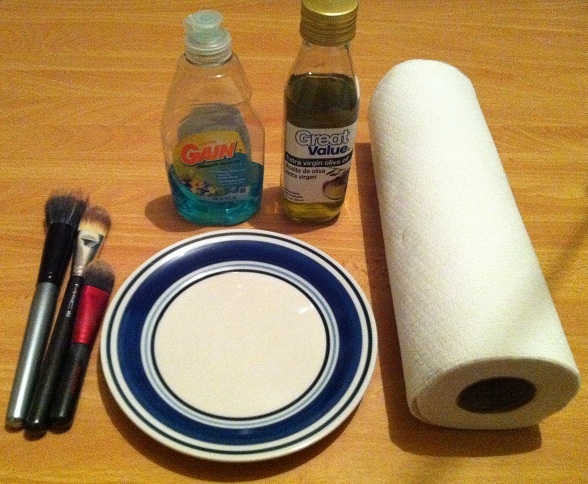 Not to mention the fact that makeup brush cleansers can be a bit pricey. So I researched the wonderful world wide web and out of all of the DIY makeup brush cleansers this is by far my favorite. It is inexpensive and best of all you probably already have these items in your kitchen. Also, this method leaves your brushes super soft, just like the first time you used them. It is very important that your makeup brush cleanser cleans and conditions your brushes so that you get the most out of them and they last a really long time. 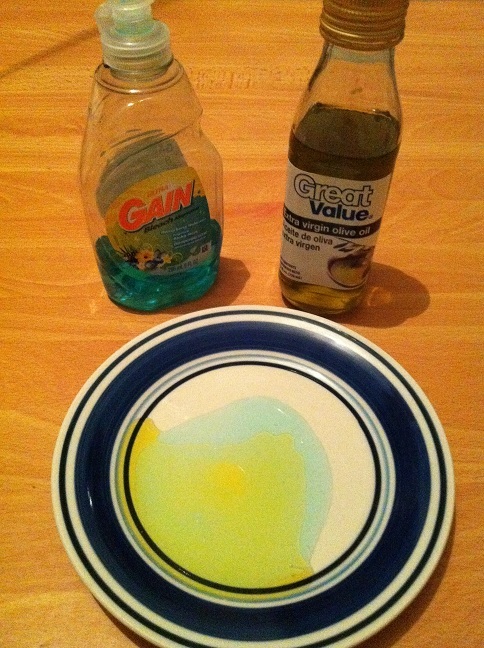 Step 1: Pour about half of a tablespoon of both the extra virgin olive oil and the dish-washing liquid detergent on top of each other as shown below. You don’t really have to measure the amounts, you can guestimate it at a little more than a quarter size amount depending on how many brushes you’d like to clean. 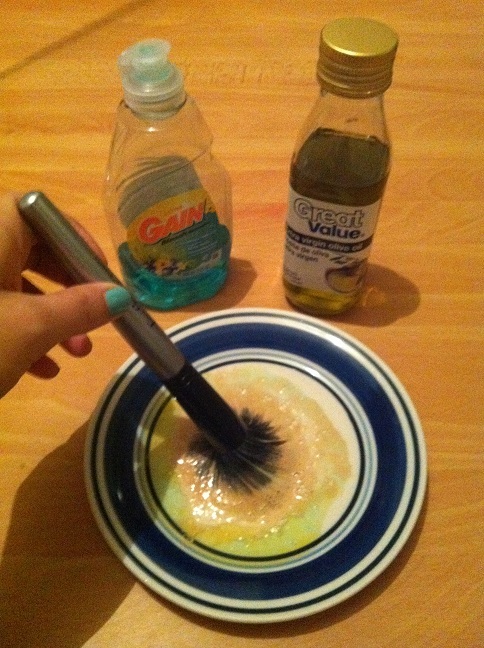 The dish-washing detergent will clean out all of the makeup from the brushes and the extra virgin olive oil will condition the brushes and keep them soft. Step 2: Swirl your brushes in the mixture in circular motions until you notice the makeup coming off of the brushes and they start looking clean. Then rinse the brushes in a sink under running water until you no longer see any more bubbles and the bristles should feel clean and not oily or soapy. 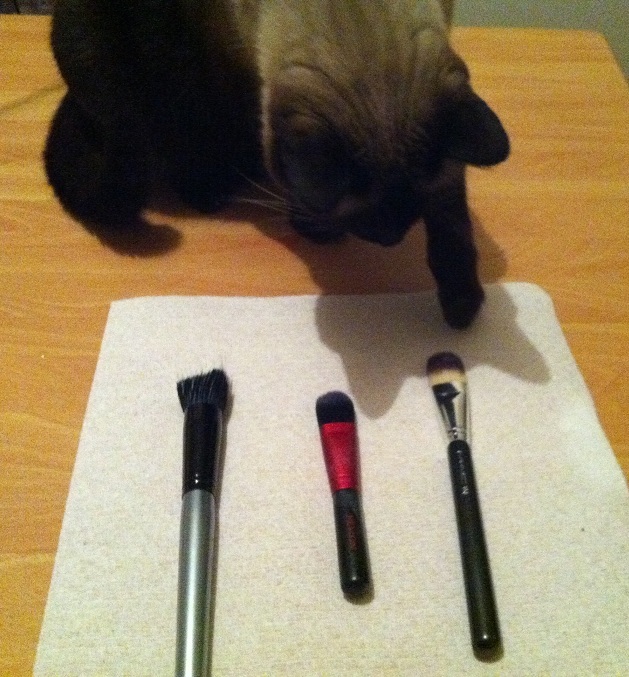 Step 3: Dab the brushes dry on a paper towel or regular kitchen towel and then lay them flat on a clean paper towel so that they can dry (curious cat is optional). If you do this before going to bed they are usually dry by morning. I recommend doing this process at least once a week or as much as needed depending on how much you use your makeup brushes.